I suggest reading this document through entirely before attempting this, there are several variations, options and things you might want to change. Also a good idea to familiarize yourself with the process and what it involves beforehand. 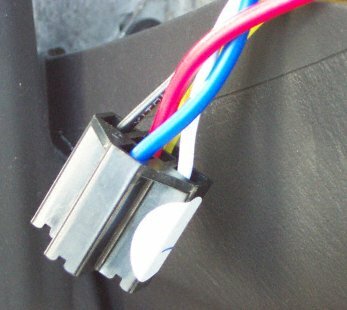 Because the Neon has inboard mounted turn signals, they are not visible from the side. Typically a manufacturer will mount a second light that is visible on the side or make the side markers blink, as they did on the 9x Neons. However on the North American 2000+ Neons the side markers do not blink and there is no side visible turn signal. So this is really a safety improvement, so that vehicles and pedestrians at right angles to you can see your turn signals, as they should. 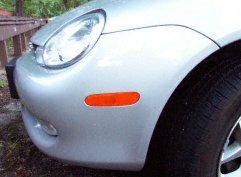 The goal in this case is a simple modification to make the side markers blink in correlation with the turn signal, while maintaining their original operation as parking lights. Also, to make the procedure as minimally intrusive as possible, reversible and easily repeatable. Being that I have a Canadian 2000 Chrysler Neon, it comes factory equipped with Daytime Running Lights (DRLs). For the Neon, this means that the front turn signals serve double duty as DRLs and as a consequence, the only "pure" turn signal signals are in the dash. (For 2003 the fog lights became the DRLs, not sure if this document applies to those vehicles.) In addition, the vehicle has been wired such that an unpowered, or unconnected lamp or circuit is simply disconnected and not grounded. All the lamps however are switched on the hot side and continuously grounded on the neutral. (Not that a lamp really has an orientation though.) So why do I care about grounding? Well, because if the hot side were grounded when "off", a standard modification used on other vehicles could be used here. That is, providing the the turn signal to the neutral side of the lamp, while maintaining the park signal to the hot side. But this does not work in this case. Another option would be to replace the side makers with a dual filament bulb and socket, but I decided against that, as it would require more modifications to the car. So thus, I'm left with rewiring the hot side of the side marker lamps to provide the signal I want. Basically, I want to merge the "pure" turn signal with the parking lamp signal. When the parking lamps are off, I want the light to illuminate directly in relation to the turn signal. When the parking lights are on, I want the light to blink off when the turn signal illuminates. In digital logic, it is an Exclusive OR (XOR) operation between the two signals. Being automotive power signals I want to switch and not digital voltages, digital logic gates are out. It is possible to construct this out of discrete transistors and such, and it would work great, but the component count and complexity of wiring increases a lot so I decided against this. So, in the end I settled on relays. A relay is an electricially controlled physical switch (or electrically controlled electronic switch in the case of solid state relays). 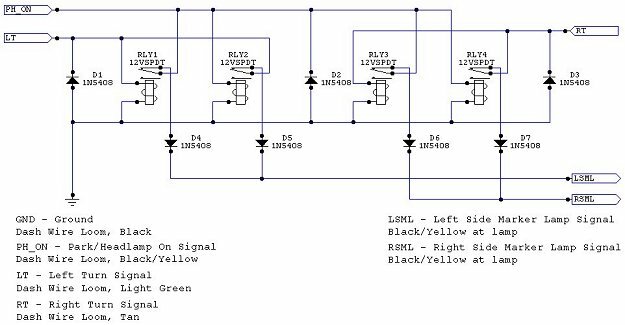 In relay or ladder logic, as it is sometimes called, a SPDT (Single Pole - Double Throw) relay can perform one of the three basic logic operations, AND, OR and NOT. XOR is formed from its inputs (A,B) as follows: XOR = [A AND (NOT(B))] OR [(NOT(A)) AND B]. Breaking that into it's simplest components, we would need 5 relays (2 NOT, 2 AND, 1 OR) to perform this operation. Luckily we can simplify. An OR operation can be simplified down to simply a connection of the two inputs directly to the outputs. This works because of the low level operation, if either of the inputs is "on" power flows to the output. This is called a wired OR and needs to be "fixed" a bit by adding diodes to make sure the power flows in the right direction and not back to the inputs. So, down to four relays. A bit of a jump here, but [A AND (NOT(B))] can be simplified from two down to a single relay. By using A as the input to the relay and having it normally connected to the output, while B, when active, disconnects the output. To understand this, consider the case when B is off. A is directly connected to the output, so when A is on, the output is on, when A is off the output is off. Now when B is on, the output is always off or disconnected. So, the only condition when the output is on, is when B is off and A is on, or [A AND (NOT(B))]. This applies to the other part as well, [(NOT(A)) AND B] becomes one relay with B connected to the input and A connected to the switch or actuator (called a coil in a relay). So, we have simplified the problem down to 2 relays (and 2 diodes). In the end, we need a set of 2 relays for each side, left and right. Note: This can be further simplified by using a DPDT (Double Pole - Double Throw). By connecting the park/headlamp signal across the coil of the DPDT relay and having both the right and left turn signals enter the relay, we can switch them at the same time. Thus we can use 2 SPDT and 1 DPDT relay. I stuck with 4 SPDT relays as they are easier to obtain. Three diodes should be added, with one across each relay coil, in other words, from ground to each of the 3 system inputs, park, left turn, right turn. This is to prevent EMF from the relay coil affecting the inputs. So, getting more detailed, the inputs to our system are the park signal, the left and right turn signals, and a ground, which we need for operation of the relay coils. The outputs are a left and right side marker lamp signal. As I said before, the only "pure", untainted by DRL, turn signals are in the dash. (Note: while the DRL tainted signals could be used, it adds needless logic to remove the DRL portion of the signal, especially since it has a parking brake inhibit.) So, those input signals must be tapped from the dash. 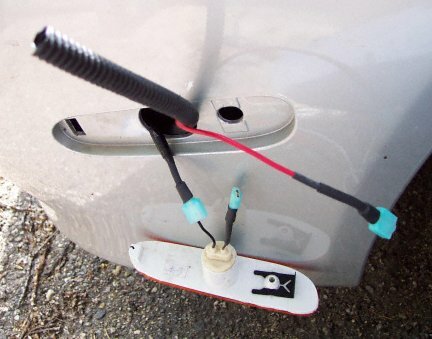 Because of the wiring of the vehicle, the side markers are driven by the same signal, and in addition, this signal also powers the front parking lamp in the turn signal lamps. Thus, we need to run a new wire from our relay circuit outputs to drive the lamps. 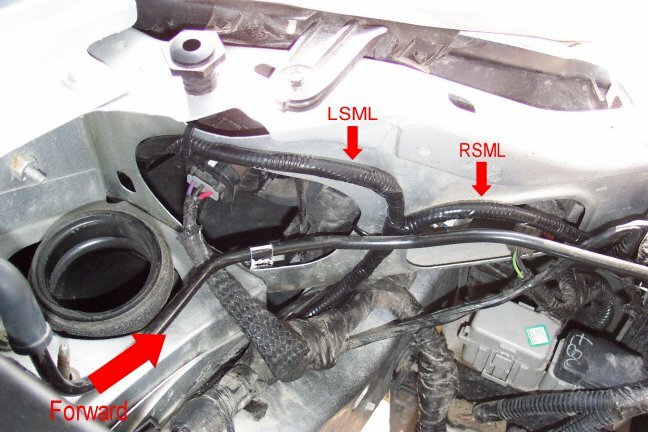 The side markers are obviously mounted up front on the bumper extremities and the hot signal wire for each must be spliced somewhere from the lamp to the splice point which is mounted under the left headlamp. I discoverd that the splice point under the headlamp is nearly impossible to get at so I spliced in near the marker lamps. So, the last thing to decide is where to put the relay circuit. Basically two choices, in the dash (interior fuse box), or in the exterior fuse box. The exterior fuse box didnt have enough room and I wasn't sure if the spare relay holders were wired or not, so I put it in the dash area, there is tons of room there, and the bulk of the signals are there anyway. I decided on standard automotive relays for the operation. They work reliably and are resiliant and long lasting. Others, including solid state could be used, but you would have to find relays with the needed properties. Namely, 12V coil drive, high immunity to noise and spikes and voltage swings. Low coil power draw, has to handle at least 2A, etc. The only downside to the standard relays is that they make a clicking noise when switching, makes the flasher a little louder. The circuit, shown below in Figure 2, switches the relays with every flash of the turn signal. Some more complex circuits could reduce the switching to once per turn signal usage, it would also add a tiny big of lag to the signal turning off and of course, complexity. Power draw from the input signals to the circuit is slightly increased from the stock configuration. Additional power is drawn from the park and turn signals to power the relay coils, a very minimal amount, still well within safe limits of the existing fuses. The turn signals have to drive the side marker lamps when the park lights are off though, about 5W each, still within margin on the fuses. Additional safety and protection could be added by placing fuses inline with the inputs. Failover mode is pretty good though. A failed relay will just mean the parking lamps are stuck in a state or two and malfunctioning. 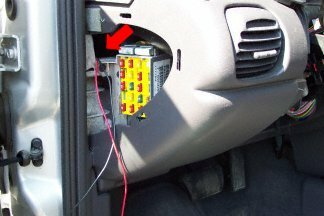 Worst case is if the diodes short out, in which case, no damage will be done, you'll just get a weird race condition in which a turn signal may temporarily drive the park signal on from its off state at the begining of a turn signal pulse. Or if relays and diodes fail, again, no damage, just the end result of malfunctioning side markers. Unfortunately this circuit doesn't add dead bulb detection for the side markers. The existing dead bulb operation for the front and rear signal lamps is unaffected. Based on the circuit I've created, the parking lamps blink in sequence with the turn signals when the parking/head lamps are off and alternatively when the parking/head lamps are on. I don't know if this will work 2001+'s, non-Canadian Neons, or perhaps even non-LX Neons, but I don't see why they wouldn't be the same. Let me know your results. I spent under $100cdn on the parts, and have left overs of most of the stuff. 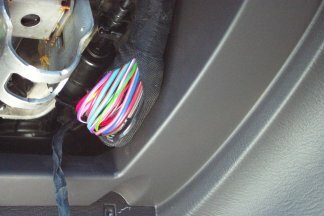 The majority of the wiring can be done beforehand and is much easier to do at a workbench than inside the car. Set the relays aside while working, no use in having them plugged into the sockets while you are working. Begin by gathering and taping the wires together in a dry run. Also a good idea to label the wires. The sockets I used accept a relay with an ISO type plug arrangement and have 5 color coded wires tailing from them. First gather all the wires that lead to the "85" connection of the relay, these will be connected to GND. Then, gather all pin 87 connections and tape these ends individually with electrical tape then tape them together, these are left unconnected, you can trim them to length so they aren't taking up too much space, but definetly tape the ends, don't want them shorting out. Next gather pin 30 of relay 1, pin 86 of relay 2, pin 30 of relay 3 and pin 86 of relay 4. These will be connected to the PH_ON signal. Gather wires from pin 86 of relay 1 and pin 30 of relay 2, these will be connected to LT. And finally gather pin 86 of relay 3 and pin 30 of relay 4, these connect to RT. 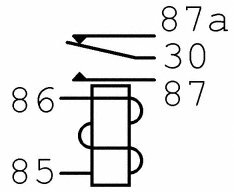 Gather pin 87a from relays 1 and 2, these are the LSML and gather pin 87a from relays 3 and 4 for RSML. You'll also need to find a place to connect the 3 diodes across the relay coil connections. At the diode socket would be a good place, or further up if its more convient to wire. After everything is gathered and in order, begin soldering the LT group which contains the 87a connection of relay 1 to the anode (the side marked with a stripe is the cathode) of diode 1. Remember to place any shrink tubing you want to use before soldering. Also remember to clean the leads of the diodes as they probably have some build up on them and solder will not stick as well. Strip about 1" from the lead and the wire and twist them together, heat the metal with the soldering iron and apply the solder to the metal not the iron. Repeat the process for each of the other 3 relays and diodes. Place any shrink tubing and then take the cathodes of diodes 1 and 2 and solder them together with a length of wire. This wire will run to the left side marker from the dash, so make sure to cut it to at least 8 feet. Repeat the procedure for diodes 3 and 4 and remember this wire has to run to the right side marker so leave at least 14 feet of wire. It would be a very good idea to use different wire colors for these two wires to identify them later. I used the convention of red wire for left lamp stuff and black wire for right lamp stuff. Similarly you can complete the connections of the left and right turn signals, the park/headlamp on signal and the ground. The group of wires you've gather for left turn (LT) is also connected with a wire which runs back to the dash loom. Right turn (RT) is as well attached to a wire running to the dash loom. 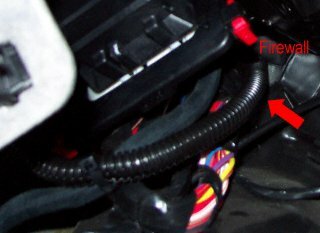 In addition the parking/head lamp on (PH_ON) and ground (GND) groups are attached to a wire running back to the dash loom. Leave about 3 feet of these wires. At this point the wiring harness is finished. 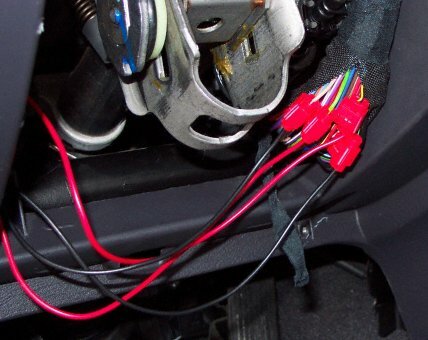 You should have 4 shorter wires leading from your relay sockets, which are destined for the dash loom and 2 long wires destined for the front side marker lamps. It would be a good idea to test the harness now. Test continuity of each pin of the relay sockets with the end of the appropriate wire. Time to head out to the car with your bundle of wire and tools. Open the interior fuse box. 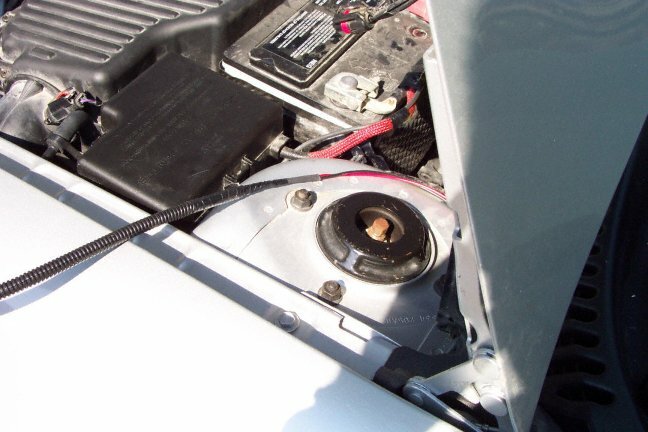 To the front of the car inside the dash above the fuse box there is an opening which leads down to the foot well. 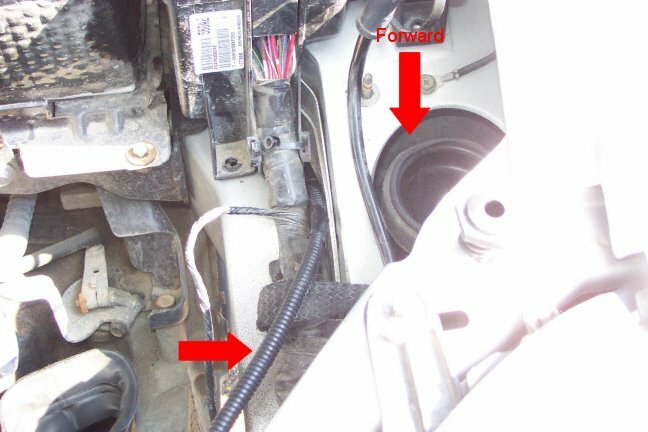 You want to take the two wires that are destined for the left and right side marker lamps and feed them down through here first. At this point take a stiff metal coat hanger and straighten it out. Tape the two wires to the end of the coat hanger, make sure they are well secured. You then want to feed the coat hanger and wire assembly through the existing wire path through the firewall. It's nice to have a friend watching the engine compartment to help out. The wire path through the firewall is up behind the dash on the interior. 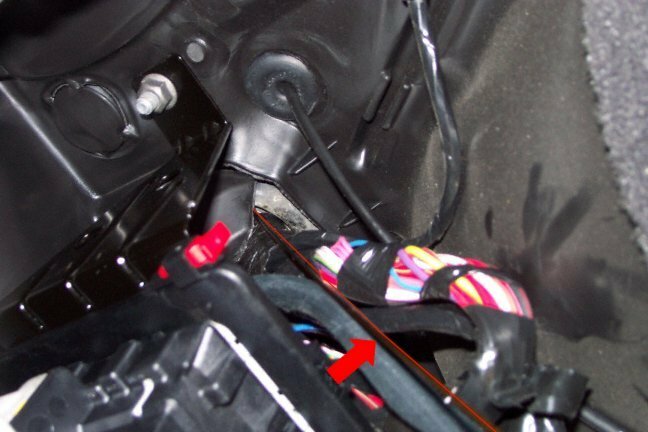 If you lay on your back in the driver's side foot well you should be able to see a large bundle of wires going through the firewall above the driver's left foot rest, just follow them closely with the coat hanger, its a straight path. Under the hood, the wires exit the firewall behind the left strut tower and you'll probably bang your coat hanger into this. You'll want to pull the wires through the firewall leaving only enough wire necessary in the dash area. I went to the added trouble of heat shrinking the wires in the location they passed through the firewall as well as taping them up. Now you have a choice. I went nuts and followed the original wire loom path exactly. This required removing a bunch of parts. (You might be able to feed the wire through without removing parts, but be prepared to fish around for a while.) It is far easier just to wind these wires around the fuse and air boxes. You'll probably want to install the wire loom before laying the wires. Make sure to secure the wires in key locations, so they don't rub on anything or get caught up, and for general appearance reasons. If you want to go all out, following the original wire loom is a bit more trouble. 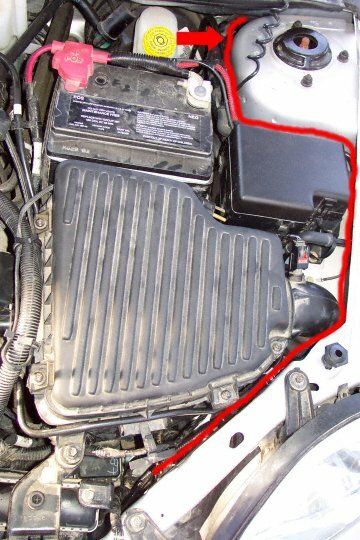 Start by removing the air box cover, remove the air filter, disconnect the throtle body and support it, stuff it with a towel to keep dirt out as well. 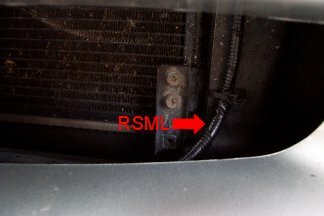 Next loosen the bolts that hold the air box and remove it, probably have to disconnect a sensor. There is also a little inflow pipe that has a sensor, both of which you'll probably want to remove. Next unbolt the fuse box. Now you should be able to snake your wires under the fuse box near the main wire loom. At this point, resecure the fuse box. Then run your wires along the main loom to the left front headlamp area. At this location I split off the right and left wires and secured the wires. The left lamp wire I ran through a hole in the fender to the lamp area. The right lamp wire I ran down in front and to the side of the radiator then across the pan in the front bumper, following the fog light wire loom. I just continued this wire along the bumper area and into the fender area containing the lamp, securing it at key locations along the way. Resecure the air box and throtle body at this point. I encased all the wires in wire loom and lightly taped it and secured it at various locations. Back inside the car now, you'll need to remove the knee bolster part of the lower dash. It has two screws on the lowermost point and is clipped at the top just under the instrument panel. You'll need to unclip the lower surround of the instrument cluster, as it clips into the dash piece we are trying to remove. You might also find it helpful to remove the covers on the steering wheel. These two halves are screwed together with two screws accessible from the bottom front and they are clipped together in the back. Inside the dash in this area there is a large wire loom running from the steering wheel down the right side and disappearing into the center cluster. You'll need to remove the loom and/or tape covering this bundle to access the wires. Back to the added wiring hanging from the interior fuse box. The remaining unconnected wires, there should be four, one for the park/headlamp on signal, one for left and right turn signals and one for ground, need to be fed through the dash towards the wiring loom you've just exposed. Each of the four wires needs to be spliced into a wire in this loom. I used some splice connectors appropriate for the guage of wire used. The park/headlamp on wire needs to be spliced to a black wire with a yellow stripe in the bundle. Cut the wire to length, leave enough room to run the wire without tension, but don't leave too much excess as you have to keep this wire in the dash in the end. Repeat for the left turn signal, which connects to a light green wire. 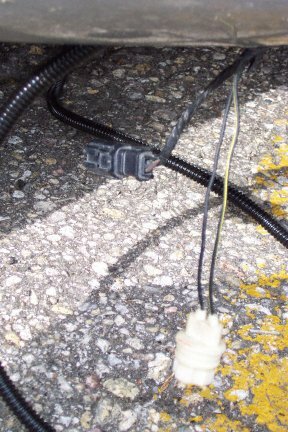 The right turn signal connects to a tan wire and the ground wire connects to a black wire. Be careful of the black wire as there are several in the bundle that are black with various color stripes. The ground wire is pure black. At this point it is a good time to test everything before cutting any stock wires. First, check the ground connection against an obvious ground near by, an unpainted metal point for instance. Check this with a voltmeter, connect one lead to a ground pin in a relay socket and the other to the obvious ground you've located. Turn the car to on and check that they voltage reads near zero. If you get something else, check for continuity or that you've spliced into the correct wire. To test all the other splices, connect the negative lead of your voltmeter to ground and the other lead to the connection under test. Test that park signal has a voltage when either the parking lamps or headlamps are on and near zero voltage when they are off. Note: when running in the on mode without the engine, the voltage should be about 10V, with the vehicle running about 12V. The turn signals are a bit trickier depending on the type of voltmeter you have. Make the connections and test that when the turn signal is off, a near zero reading is indicated. When the turn signals are on, you should see a varying voltage between 10/12V and zero or possibly no reading on a digital voltmeter because it cannot lock on to the varying signal. Read your voltmeter manual to determine its operation. Another method of testing would be to use a spare lamp to test the signals. Use some test leads to connect the lamp to the various parts of the circuit you are testing. Although the ground should be tested with a meter. Add the relays to the assembly now and then test the outputs of the wires you've pulled to the left and right lamp areas, preferably against the existing ground of the lamp, but that requires further disassembly, more on this later. Test operation of the left and right turn signals, parking lamps, headlamp and hazard operation and combinations of the above. Verify all existing lamps on your vehicle still function correctly. If everything tests correctly you can reassemble the dash. Add any wire loom you'd like and secure the wires. Make sure to secure the wires running through the firewall as they could dangle and get caught in your feet while driving. I used some double sided foam tape to secure the relay assemblies against the front portion of the dash. You can mount them however you would like. Now up to the front corners of the car. Note: this a good time to install clear markers if you want. Before starting, I found that cranking the wheel hard over to the same side of the car I was working on was very helpful. 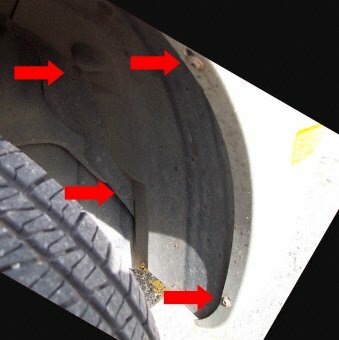 You'll need to remove the front wheel well linings. 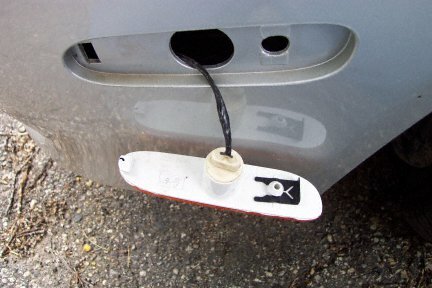 These are secured by two torx 25 screws on the outer fender and two non-reversible plastic plugs on the inboard side. I hate these silly plugs and use various combinations of pliers to push and pull them out, deforming them in the process (You can get new ones from the dealer $2.75cdn each, or from an automotive supply store more like $2.75cdn a pack). You should then be able to pull the liner back towards the wheel. 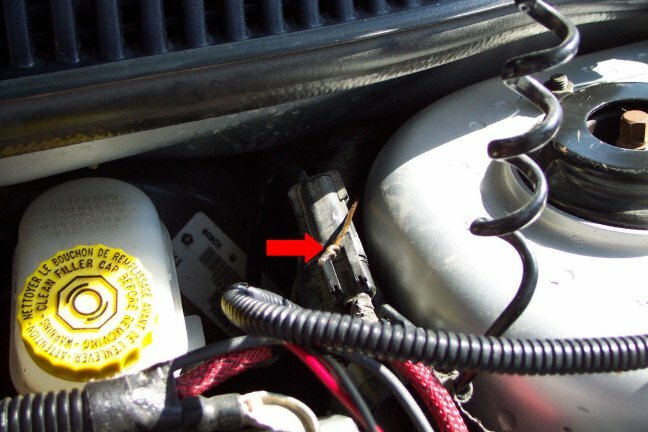 You'll need to remove the reflector assembly for the side marker lamps, this is done by pulling a clip on the nearest side of the rear of the assembly towards the rear of the car. The assembly should then be able to be pulled out from the outside. 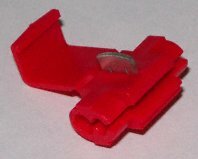 The bulb socket can be removed from the reflector by turning and then pulling. Probably a good idea to remove the bulb and set it aside somewhere safe. Two wires enter the bulb socket, one is solid black, which leads to a ground and will remain intact. The other is black with a yellow stripe which we will be altering. I found that you can't get much slack on these wires, so its a little tedious to work with. At this point, make sure your new wire is run to this area and has plenty of slack available. Note: An alternate, less instrusive way to do this would be to get a set of new bulb sockets, and splice into the ground wire of the old one. Nice and clean, no cut wires, just tape up the old socket and leave it dangling in the bumper well. I think this should be the preferred method. Having a second chance, I would have done this. I cut the existing wire (black with yellow stripe) in about the middle of the slack I had, leaving about three inches of visible slack on each side. I added shrink tube to both sides, stripped about 1/4" of the wire and crimped on connectors to both sides. I used female on the lamp side and male on the vehicle, it doesn't really matter which way. After crimping, connect the wires and test bulb operation again. It should still function solely as a parking lamp. (Here is the reversible part, just plug the original wires back together to restore original operation. You could also jumper the relay sockets in the dash to restore original operation.) Then cut your newly pulled wire to length, strip off 1/4" add any shrink tubing and crimp a connector on, male in this case. 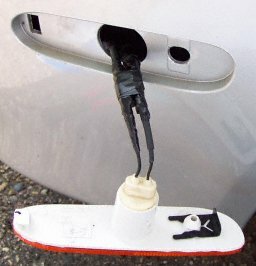 Connect this to the lamp socket and test operation, it should now function as both a turn signal and parking lamp. Note: based on the circuit I've created, the parking lamps blink in sequence with the turn signals when the parking/head lamps are off and alternatively when the parking/head lamps are on. Check all your other lamps to be certain they are still properly functional. If all is succesful, tape up all the wires and connectors, make sure to tape up the spare original connector. Reassemble the reflector and bulb, mount and finally, reassemble the wheel well liner. Repeat for the other side. I had some trouble getting slack on the right side so I unplugged a couple wires and pulled it out the bottom of the bumper to help. If all went well, you should be done now. As a final thought, after everything is reassembled double check operation of all lamps in all the various settings. Take the car for a short test drive to see if you notice anything strange such as flickering of interior status or illumination lamps. 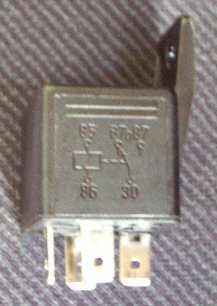 Note: the relays are electro-mechanical and so do make some additional noise when switching, you'll probably notice a louder turn signal indicator. Just a note, I didn't have the benefit of this HOWTO when I started, so the actual procedure I used was different than shown here, so some of the pictures might show something that is out of whack, may have been taken after the fact or at a different stage of the process, but they illustrate the point. The procedure isn't as simple as I would have liked, but it is dictated by the factory wiring so this process isn't for the faint of heart. It is repeatable though and easily reversible. Drop me an email with any results if you attempt this. Good luck and safe driving. Robert Williams completed the mod on his 2001 R/T. He mounted a pair of relays in each fender, tapped the turn signals from the front turn signal lamps (he has no DRL), PH_ON and GND from the exising side marker socket and fed this into a new socket (no cut wires). With DRLs this would work too, just need to run 2 wires from the dash for the left/right turn signals, although you'll want to wrap the relays and connections well, as they are exposed in the fender. An update, I've been using the modification through a glorius Canadian winter without problems. March 25, 2002 - I made a change to the schematic to add protection diodes for back EMF from the relay coils suggested by Tom P and others. An obvious alternative would be to get a new socket for a dual filament bulb. You could then feed the "low beam" filament from the PH_ON and the "high beam" filament from the LT or RT signal. You forgo the relays, but have to worry about finding a socket that fits in the reflector and doesn't draw too much power or generate too much heat.